This Golden Retriever puppy is as playful as it gets! It is crouching with its tail up and wagging it wildly. 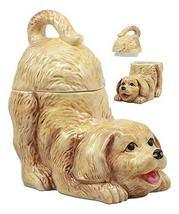 You can use this cookie jar for all kinds of things from cookies to coins or if you are a Golden Retriever lover, you can use it for dog treats!